Monopolies in a stateless society? 82% say they would rather pursue their own interests than go to the National Youth Service Corps or NYSC. Does the Nigerian Government, which is YOU & I, have the right force these 82% to attend NYSC? Is it OK to force you to do something you don’t like? NYSC exposes everything that’s wrong with our system, which is COMPULSION. In Nigeria, your land belongs to the government, whether you like it or not. If you find gold in your ‘rented’ land, it belongs to the government. Everything government is assigned to do is compulsion. Everything. This is why restructuring is about collecting back the items assigned to government. Compulsion doesn’t make things work. It makes things worse, which is why we are poor and plunged into crises. We need to substitute our current system with one based on VOLUNTARISM. Voluntarism, or freedom, means the elimination of force. The more you eliminate force, the more prosperous and peaceful you become. Since 1960, my parents’ generation has been looking for messiahs a.k.a good politicians to use the country’s resources to take care of them. That hasn’t worked. In fact, it made us poorer and plunged us into ethnic and religious crises. Again and unfortunately, my generation has joined the same bandwagon, searching for messiahs for the same impossible. That will not work for us either. There’s not going to be messiahs. The only messiah is yourself. Only you can save yourself. You can choose freedom a.k.a be your own messiah or choose Nigeria’s 1999 Constitution, continue searching for messiahs. The later has been tried by my parents’ generation and never worked. The former is proven to work anywhere it’s been tried because it is consistent with human nature. You can either choose freedom or poverty and crises. I hope you choose freedom. Freedom is the gateway to prosperity and ethnic/religious tolerance. Freedom is hope. True Federalism is about giving each Nigerian the power to be his or her own boss by vesting powers to him or her while at the same time denying government such powers except for police, courts and defense. In Nigeria for example, if you find oil in your land it belongs to the government. However, under True Federalism the oil belongs to the owner of the land while the government would be denied such right. The government must be denied such right explicitly while also affirming the right of the people to own natural resources in writing. The content of the writing is known as a constitution. As you might have noticed, a constitution should be a book to prevent government of doing anything other than to provide police, courts and defense. This is because a government with more powers would do more harm to you than anything else. A Government is like a fire, when properly caged like in stove, it would do good but once it is in the open, it would do lots of damage. Unfortunately, the constitution of Nigeria confers the government the rights to more than just the police, courts and defense. It confers it with the ownership of natural resources, education, JAMB, NECO, land, central banking and many more. It also centralizes most of these powers, making the whole system even more inefficient and amplifies its negative effect. That is what True Federalism means to me. This philosophy is known as liberalism or freedom. Freedom means the absence of force. It is the philosophy of love, prosperity and peace. In fact, the freer a country is, the more prosperous and peaceful it is. There’s no system that is perfect because humans are not perfect, but a system designed based on freedom is better than any other system. To start True Federalism in Nigeria, we would need to assign the Federal Government the powers of the Supreme Court and defense. Nigerians in their respective states would figure out how to provide police and other lower courts, everything else belongs to each Nigerian. It is simple and straightforward philosophy, if you find gold in your land, it is yours not the government’s. Education? It is yours to provide. Under True Federalism, you are the boss. Should you search for good leaders or demand freedom? Option A) Give the One Million Naira to some people to use it to take care of your needs when you need it. Option B ) Give the money to you so you could take care of your needs yourself. Option (A) describes the concept of good leaders, which means you would hope to get GOOD/HONEST LEADERS who would not use your money for their personal gains but use it to take care of your needs. Option (B) however is the concept of freedom in which you are responsible for your needs and ALSO own the money (resources, land, oil, etc). When Nigerians glamour for good leaders they are clamoring for honest people to get into government and use the peoples’ resources to fulfill their needs. They are NOT looking for people who would go into government to transfer powers/resources to them (land, JAMB, NECO, oil, coal, NYSC, everything aside from police, courts and defense). Looking for someone to take care of you using your One Million Naira is different from looking for someone who would return your One Million Naira. Nigerians and Africans at large have and continue to look for good leaders who would manage their resources, use the resources to fund their needs. That is not freedom. That is slavery (depending on someone else’ decision/will). The good-leader arrangement eventually leads to poverty, conflicts, and deaths. We need to be looking for ANYONE who would return our freedom (our resources, powers etc). For Nigerians to be free, government must own and do only a few duties. These duties should be those that PROTECT YOU from government itself and other people that would want to hurt you (minimize force)*. These are defense/border protection, police, courts, protection of our human and property rights. All these duties are geared towards protecting YOU. So basically, you are free to live your life the way you want it and the government would protect you to live your life. In contrast to our current system in which the government owns EVERYTHING, use those things to provide your needs (if you are rich and in government or know someone in government) leaving you at their mercy (force). This arrangement leads to poverty, conflict, and deaths. Each individual Nigerian would own his/her resources to provide everything else for him/herself. The reason why this arrangement works is because, the more a country minimizes force (governmental and non-governmental*), thereby maximizes freedom, the more prosperous and peaceful that country would be. View a government like referee/linesmen in a football game. These officials are only there to flag wrong doing. They do not participate in the actual playing of the game. This is the same with what government’s duty-to PROTECT YOU FROM HARM SO YOU COULD LIVE YOUR LIFE. Imagine if the referee is the one deciding who should win or lose and not the players themselves. Federal Government should provide defense/border protection, courts, and protect human/property rights. States should provide courts, police, and protect human/property rights. 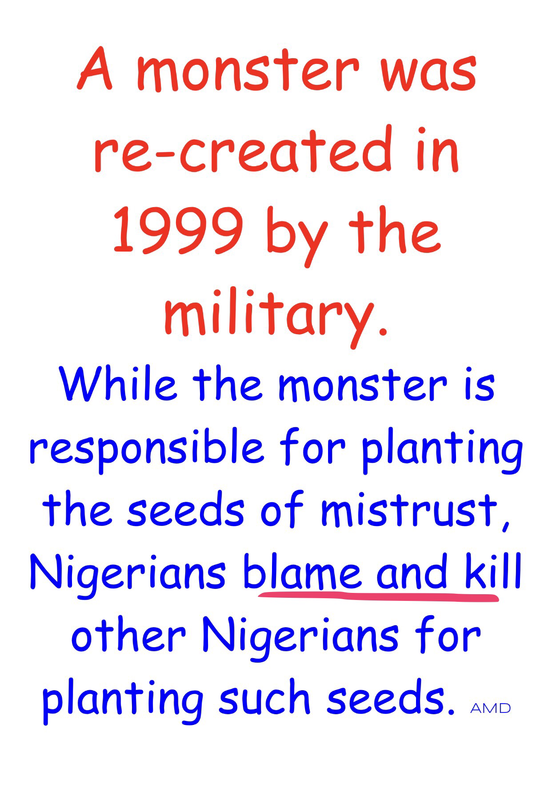 Nigeria’s military gave us a monster in 1999.
poverty, diseases and so on. Caleb Yakubu joins me to support restructuring.